On Friday I popped over to Manchester for a catch up with a few friends and chance to sample some of Manchester’s most atmospheric pubs. 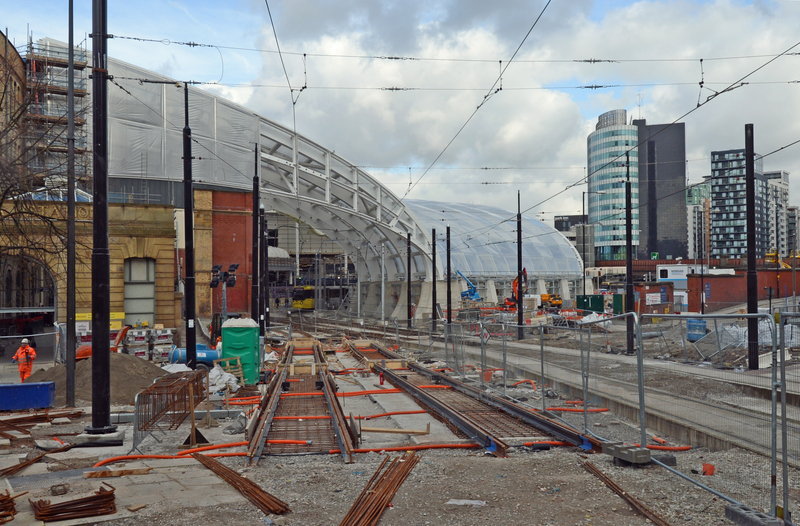 A bonus to this foray across the Pennines was the chance to check out progress on the refurbishment of Manchester Victoria station & Northern hub electrification work. The ‘march of the masts ‘has progressed Eastwards from the station with the first concrete mast bases & uprights appearing past Cheetham Hill road bridge. Contact wires have been strung on all the through roads although there’s a lot of work to be done before they can be energised. The West end of the station appears to be fully wired. The area’s a veritable forest of masts & cables now. This has resulted in the loss of a well used photographic location because the view from the footbridge outside the station is obscured by the ‘knitting’. In addition, the bridge sides have been built up to protect unwary passengers from the overheads. In another new development, automatic ticket gates have appeared on the concourse between platforms 1-3, leading to some of the exits on platform 3 near the train crew office being blocked off. These were used by fare dodgers ‘in the know’ but also by staff slipping out for a fag break! Progress on the roof & concourse is impressive. Many of the ETFE panels have been installed in the roof structure making Victoria watertight for the first time in decades! Hoardings have been stripped away from the concourse & much of the temporary raft protecting passengers from work above has been removed. This has really opened the area up. Now it’s possible to start to an impression of what the station will be like when it’s finally complete. The Metrolink tram stop has changed too. There’s now a maze of tram tracks leading out of the station into town as the junctions for the second crossing of the city have been installed. The tram stop has been remodeled to provide an extra platform & through road to cope with the vast increase in services. Work continues to the inside of the building with no major changes discernible to the public just yet – but it’s only a matter of time. It’s great to see a previously neglected Manchester gateway receiving the attention that it deserves. The complex tram trackwork that accommodates the new second city crossing which branches off to the right of the picture. Looking towards Victoria from Shudehill. 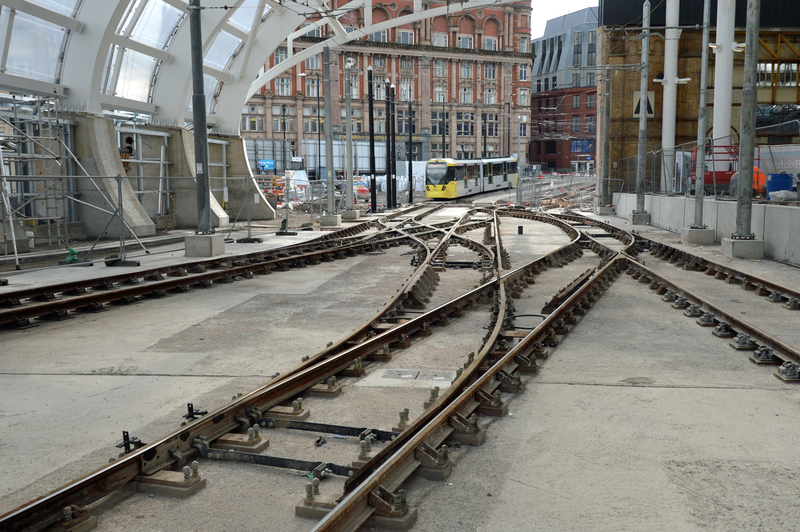 The original tram tracks are on the right, whilst the new second city crossing is being built on the left. 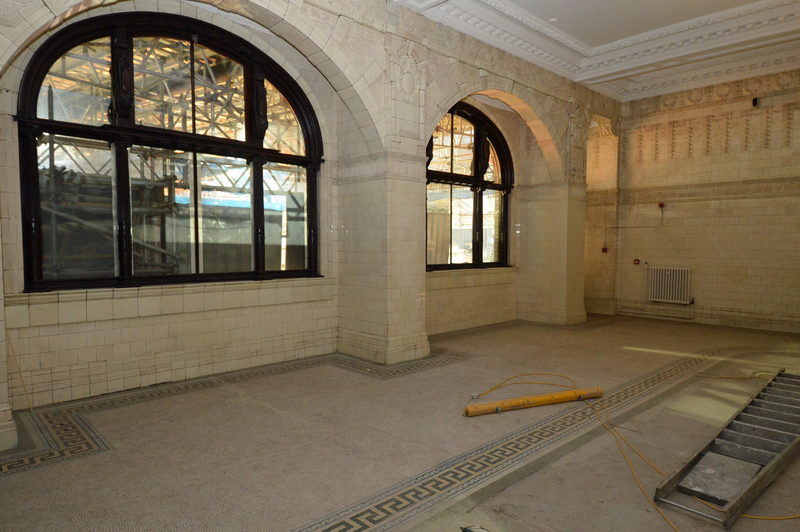 One of the rooms in a main building alongside the tram stop. The tiles have all been cleaned and restored. 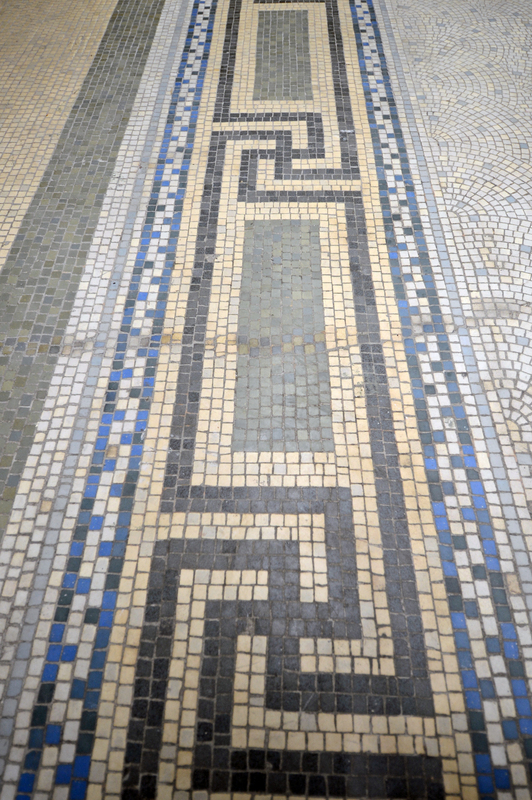 The pattern on the floor gives away the shape of the former counter. This is an old smoking room.The panels have all been restored but the original seating has disappeared. 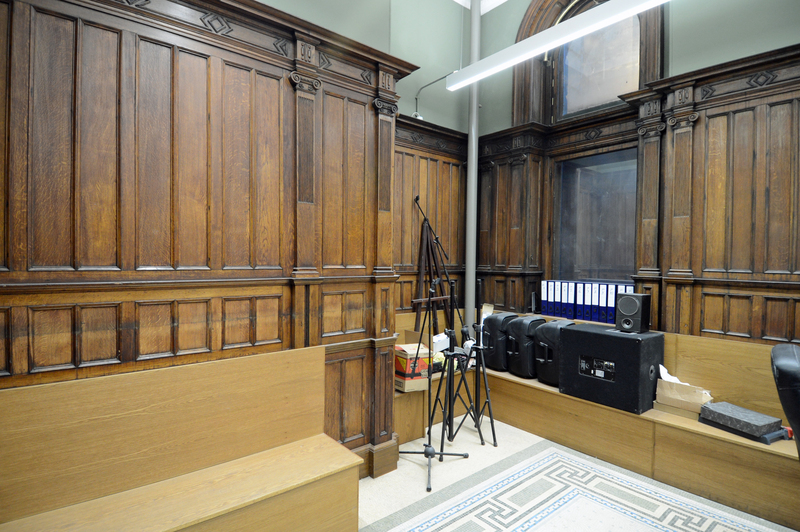 This room won’t be seen by the public when the building reopens. Ornate tiling in the smoking room. What? Hs2 ‘unlawful’? That’s one hell of a claim Natalie! I mean – you did actually read the link the the article in the Camden New Journal before retweeting this steaming pile of ordure, didn’t you? There’s plenty on the Pergau Dam scandal in this Guardian article. In contrast, Hs2 is a project with Cross party support that’s been vetted by Parliament numerous times. The Hs2 Hybrid Bill was passed democratically by 452 MPs. To try & compare it with arms for aid is (quite frankly) stupid. Oh, and one more thing. If Natalie Bennett’s brain wasn’t stuck in neutral yet again she might just possibly have paused & thought, ‘hang on, there’s been numerous Judicial Reviews of Hs2 – why have none of them picked this bombshell up’? Instead, she’s let the anti Hs2 mob make her complicit in their deception -and she’s conned the 50 people who’ve either liked or re-tweeted this crap. 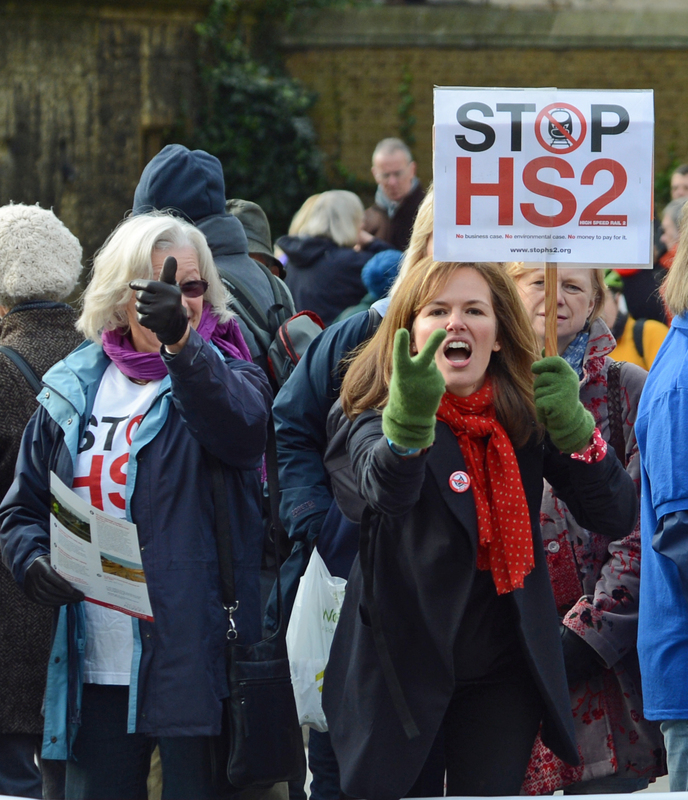 The anti Hs2 campaign’s ‘fightback’ turns out to be a damp squib! I suspect anti Hs2 campaigners began today with such high hopes. After all, today was going to be THEIR day. First off would be a ‘damning’ (as they love to call anything even slightly critical) report by the House of Lords Economic Activity Committee into Hs2. Then, whilst Hs2 & its supporters were reeling from this blow to the solar plexus, Cheryl Gillan & the massed ranks of anti Hs2 MPs would deliver a knock-out punch in their Parliamentary debate. The HoL report is a poor piece of work that’s full of holes & omissions. Although it’s had some media attention it hasn’t had the wall to wall coverage the antis were hoping for & it certainly hasn’t changed the minds of anyone in power. But worse was to come. The Gillan debate was truly, deeply, awful! Only a handful of the 41 MPs who voted against Hs2 even bothered to turn up. It was the usual suspects (Gillan, Fabricant, Dobson etc) and – more tellingly – not a single, solitary new MP opposed Hs2. Even UKIPs two rebadged ex-Tory MPs didn’t bother. Mind you, both of them support Hs2, which leaves UKIP in a bit of a quandry! The anti MPs trotted out the same tired & trite arguments that they’ve rehearsed so well & that have failed them for so long. The only new line was Kelvin Hopkins MP trying to introduce the ridiculous claim that Hs2 will really cost £138bn (a lie exposed here). When they’d run out of steam, Shadow Transport Secretary Lilian Greenwood MP stood up. Without fuss she calmly & methodically put the case for Hs2 & left them in no doubt that Labour remain fully behind the project. When she’d finished, Transport Secretary Robert Goodwill did exactly the same thing for the coalition. He reiterated all the main points for the project, demonstrating that the Government are both unmoved & unruffled by the antis last ditch attempt to alter minds before the election. To add to the antis woes today has been a busy & eventful news day and – yet again, they’ve been upstaged by Jeremy Clarkson! Meanwhile, at the same time The London Infrastructure Summit was going ahead. 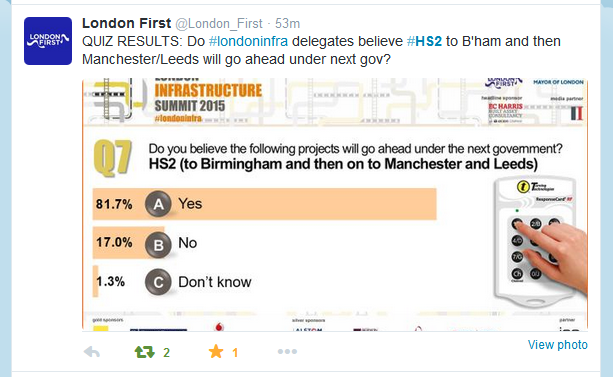 Delegates were asked if they thought Hs2 would go ahead under the next Government. Their answer? The truth about this debate is it was only really ever about one thing: Realpolotik. In other words, a handful of MPs showing a minority of their constituents who oppose Hs2 that they’re doing the ‘right thing’ by them in order to keep their seats. Their parties (of both colours) know their opposition to Hs2 won’t make the slightest shred of difference as the project has too much support. They can comfortably absorb such a tiny ‘rebellion’. There’s not a cat in hell’s chance of them succeeding, so their parties can accommodate them, knowing that it just might improve the chances of them holding onto their seats in an election year when every one may count. Tomorrow there may (or may not) be some media attention paid to a few elderly Lords publishing their report on Hs2, one of whom is a notorious climate change sceptic, Lord Lawson – not the sort of man to endorse green rail travel! Whatever, I’m sure those opposed to Hs2 will be going into absolute paroxysms over it as we’re in the run up to an election and they’re desperate for some good news. So, let’s have a little reality check, shall we? The Hs2 Hybrid Bill was voted through by a massive majority of 452 MPs of all parties. Hs2 is supported by all the major political parties – regardless of political persuasion. Hs2 is supported by the ‘core cities’ group consisting of Birmingham, Bristol, Cardiff, Glasgow, Leeds, Liverpool, Manchester, Newcastle, Nottingham & Sheffield. Let’s also remember what political & economic powerhouses those cities are. Hs2 is also supported by the CBI, the British Chambers of Commerce & local government. Billions of pounds of city regeneration schemes in London, Leeds, Manchester & Birmingham are riding on the back of Hs2, not to mention the thousands of jobs & wealth those will create. Now, what was all that fuss about four unelected Lords? In the meantime, Labour have come straight out and said the Lords report alters nothing! This is immediately run through the anti Hs2 spin machine to become (take your pick) “The House of Lords has” -‘damned/trashed/debunked/annihilated’ the case for Hs2. So, no hysteria there then! The anti Hs2 campaign group Hs2aa like to pretend that they have more integrity than fellow travellers StopHs2 (whom they look down their noses on – especially Campaign Manager Joe Rukin, a man who’s notorious for telling porkies). The reality is – it’s a load of hypocritical nonsense – as the latest rubbish about the ‘true cost’ of Hs2 being £138bn shows in spades. This fantasy figure was concocted by Dan Mitchell and Andrew Bodman & presented in a petition to the HS2 Select Committee on March 2nd. “The total cost of HS2 (Phases One and Two) could well reach £138 billion, maybe more. Yet the official figure is £50 billion including trains. The largest additional amount (£30 billion) is the ongoing subsidy that is likely to be required. Only two high speed lines in the world are thought to be profitable (Paris – Lyon and Tokyo – Osaka) and it is extremely unlikely that HS2 will join that exclusive club. A subsidy will be needed to cover the interest payments on the considerable debt incurred in building this line, higher operating costs of such trains and revenues that fail to match forecasts as passenger numbers will probably turn out to be less than expected. Several countries subsidise their high speed lines by $1bn per year or more. A £0.5bn subsidy per year has been estimated over 60 years. It also appears that the construction costs for Phase Two have been significantly understated. At present, the estimated construction cost (without contingency) of Phase One is £108m per mile while that for Phase Two is £59m per mile. By referencing the construction cost per mile for HS1, the HS2 Phase One cost per mile seems the more likely. With the current contingency for HS2 construction costs being 70%, it means the Phase Two construction cost is likely to rise from £21.2bn to £39.4bn. The next element to be factored in is an additional power station bearing in mind how little spare generating capacity the UK has at present. Using input from electrical engineers, it is believed that an additional medium sized power station will be required to meet the demands of these powerful trains on what will be an intensively used series of lines. £16bn has been added to cover this requirement. Furthermore Crossrail 2 will be needed at Euston to help the onward travel of rail passengers to their end destinations. The existing Underground services will be unable to cope with such significant increases of passenger numbers once HS2 Phase Two is running, and this shortcoming has been recognised by Transport for London. We have suggested a £7bn contribution to Crossrail 2 which is approximately a quarter of its total estimated cost to ensure that this work proceeds, and in a timely fashion. Currently there is no research and development budget for HS2 which seems extraordinary when the plan is to run trains faster than in most other countries and more intensively between London and Birmingham than on any other high speed line in the world. There are many issues needing investigation including electrical engineering, vibration, sound and other speed related issues. A nominal £5bn for research and development has been added. Other areas that have been added include security, track maintenance and upgrading the overhead line equipment on sections of the West Coast Mainline and East Coast Mainline (used by classic compatible HS2 trains) to provide improved reliability. There are a number of costs associated with HS2 which cannot be readily costed at this stage, e.g. the HS2 Growth Taskforce Schemes for getting cities HS2 ready. In addition there are concerns that some of the contingency amounts may be insufficient bearing in mind the recent cost increases which have occurred on the Great Western and other electrification programmes. 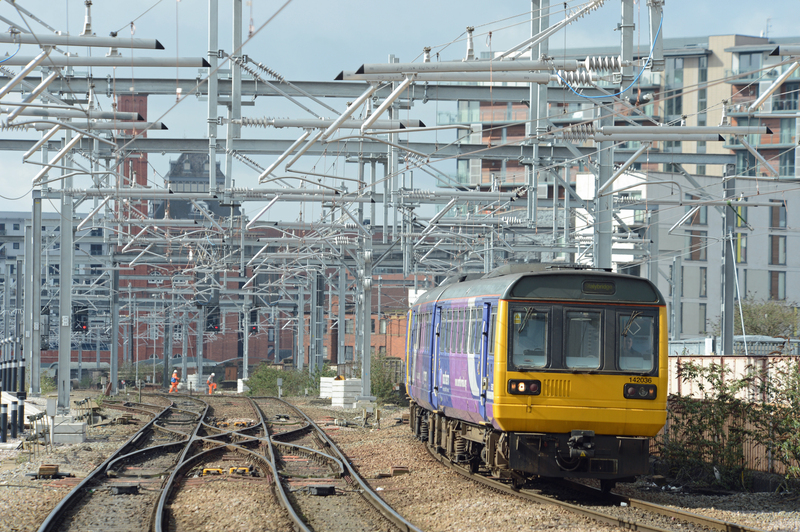 The cost of the Great Western Electrification programme has gone up by 70% in the latter half of 2014 alone and 180% since first conceived, while the cost of each connection to the National Grid has increased by 150%. Let’s dissect these claims, shall we…? As the Hybrid Bill Committee very promptly picked up, other countries make policy decisions to subsidise their railways more than we do. But that’s just one reason why alleging that HS2 will need a subsidy on the basis of international comparisons is invalid. First, our InterCity trunk routes serving the markets that HS2 will work in now pay premiums to the DfT for their franchises, so why should HS2 not do the same? Then, our high speed line will be used more intensively than those abroad, so will have more trains earning money on its infrastructure to share the cost. As to the expected figures, the “Economic Case for HS2” in Table 15 shows a Present Value (that is, figures for every year of the project life rolled into one) of operating costs of £22.1 billion, and a Present Value for fares revenue of £31.1 billion. So, far from requiring a subsidy, over the project life fares will exceed operating costs by a total of £9 billion. No, it is not valid to estimate the Phase 2 cost from Phase 1, as Phase 1 has more of the expensive items such as stations – not just Euston but also Old Oak Common, Birmingham Interchange with its 4-track section and complex junctions, and Birmingham Curzon Street – and tunnels. By comparison, Phase 2 is a relatively simple job, with less in the way of additional stations, tunnelling and complex junctions relative to its length. Not this old chestnut again! TfL have stated clearly that they regard Crossrail 2 as essential for London full stop. It simply makes sense to construct its station box at Euston/Kings Cross at the same time as Euston is being rebuilt. If anyone could identify a true incremental cost imposed by HS2 they might have a point, but no-one has. The £7 bn suggested to be charged to HS2 is not only arbitrary but a paper transfer, as it would just make the funding requirement for Crossrail2 £7 bn lower and leave total UK spending exactly where it would have been. But if you insist, just remember when charging HS2 with a quarter of the cost, to credit HS2 with a quarter of the benefits. And that means that effect on the HS2 BCR is zilch. This is pure fantasy. When did BR ever spend that much on research, whilst developing pioneering technologies such as Solid State Interlocking for signalling systems? And just for once we are learning from the high speed pioneers, rather than making the mistakes that others then learn from. HS2 is based around proven, off the shelf technology. No, this has not been forgotten. Maintenance of the HS2 infrastructure, and the track access charge to pay Network rail to maintain theirs, are both in the calculated operating costs. Well even if this isn’t just plucked out of the air, and not already counted in the capital costs, its benefits will be shared by all trains on the routes in question, not just HS2 trains. So the costs should be shared, and that doesn’t leave very much to be charged to HS2. To be funded by property development. As for the rest, how am I meant to know any more than Bodman or Mitchell? None of this is their speciality any more than mine. But if their research is as valid as the big items above, it doesn’t bode well – for them. Who can forget the lie from Hs2aa Director of Local Campaigns Peter Chegwyn about Coventry having a worse service than in steam days (nailed here)? Or their lie about £8.3bn of ‘service cuts’ (nailed here)? March has been a busy month for the railways. We’ve had new franchises launched, the arrival of the first of the next generation of Intercity trains & the start of new electric train services in the North West. There was another major milestone, but that’s not attracted the same level of attention. I’m talking about the completion of the £280 million rebuilding of the 86-mile GNGE ‘joint’ line which runs from Werrington (just north of Peterborough) through Spalding, Sleaford, Lincoln and Gainsborough, reconnecting with the East Coast Main Line at Doncaster. The Great Northern Railway and its rival the Great Eastern Railway established the Great Northern and Great Eastern Joint Railway in 1879, with the final section linking Spalding & Lincoln opening in 1882. The main purpose of the route was to allow Yorkshire coal to be brought to East Anglia, although the line was also used by a rather sparse passenger service which remains little changed to this day. Throughout the BR years the line went into steady decline, losing much of its importance (and freight) when the section from Spalding to March closed in November 1982. At one time, much seasonal traffic was generated by the Spalding bulb festival with excursion trains arriving in the town from all around the UK. Now, even the sidings these trains were stabled in have disappeared. The lines fortunes changed after privatisation when the railways stopped contracting and began expanding once more. Network Rail undertook a review of lines & decided to upgrade the GNGE as part of its East Coast Main Line Capacity Relief Project, providing an alternative route for both passenger & freight services. The intention was to increase line capacity, raise speeds from 60 to 75 mph and increase the loading gauge to W10 in order to allow the line to be used as a diversionary route by the growing number of intermodal trains traversing the network. Previously, these trains had been barred from the line. In the end, the Alliance managed to raise the loading gauge further to W12 at no extra cost. Level crossings: This saw the largest ever level crossing replacement programme of its type on the national rail network, with all of the GNGE route’s 147 level crossings individually risk assessed to determine specific requirements, leading to the renewal/enhancement of 61 level crossings along the line of route & the closure of 3 more. Crossings have been converted to manually controlled barriers with object detection (MCB-OD) operation or MCB- CCTV controlled operation. The work allowed some permanent line speed restrictions to be lifted. Track: 83,000 yards of plain line renewals, which entailed replacing wooden sleepers & jointed track with concrete sleepers & continuous welded rail. 70,000 yards of rerailing. Replacing dozens of switches & crossings (for example, the junction at Sleaford North). 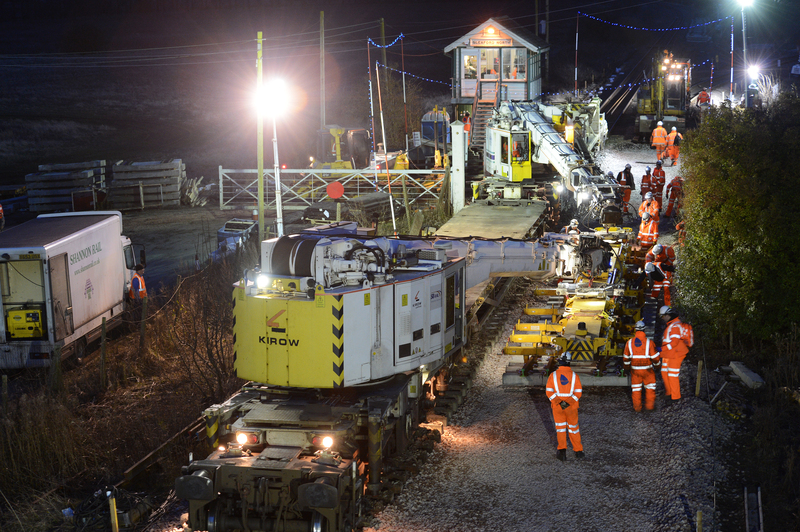 The re-instatment of double track on the Sleaford avoiding line by renewing & reconnecting the previously abandoned Down line. One of the many upsides to this work is that its reduced noise and vibration levels suffered by residents living close to the line as well as extending maintenance periods to 15 years. Signalling: Closing 13 manual signalboxes & renewing the associated colour light & semaphore signalling. Replacing them with modular LED signals controlled from the signalling centre at Lincoln (although the line will eventually be controlled from the ROC at York). Bridges & Tunnels: 49 underbridges, 19 overbridges and 82 culverts were either renewed or refurbished whilst track was lowered for 66 metres inside the sole tunnel on the line at Washingborough. One of the biggest jobs was at Sleaford, when 3 bridges (rail over road, rail over rail & rail over river) were replaced in one 10 day blockade. Other work included 150,000 yards of vegetation clearance to improve lineside access and prevent autumnal leaf fall problems. 83,000 yards of fencing and 66,000 yards of concrete cable troughing were replaced. The project was due to run from 2012 until late 2014 but due to the fact the line was an important diversionary route the timetable was extended into 2015. The landslip at Hatfield Colliery in 2014 had quite an impact on the programme as the diversion of traffic due to that event increased traffic levels on the joint line & forced some of the GNGE works to be rescheduled. A ‘wires down’ incident at Retford didn’t help as this also caused work to be postponed. Even so, a project that was originally planned as a four year scheme was undertaken in around half the time. With a project of this size & nature it was vital to engage with the people & communities who lived along the route as some would suffer significant inconvenience. On one occasion this involved the Alliance laying on a minibus service to get people to & from their homes which had been isolated by a temporary level crossing closure. Another time a fire engine was hired & stationed near a row of houses cut off from the main roads – just in case! At another site the Alliance worked with villagers to cut trespass caused by people taking a shortcut across the line. A new pedestrian subway was cut through the embankment to allow safe crossing. This work wasn’t in the project scope but after consultations with residents it was decided to include it. At Heighington the Alliance donated £1,000 to help fund the restoration work at the Community centre. All these legacies include significant environmental and community schemes which have enhanced the railway’s reputation as a good neighbour, as well as being beneficial in their own right. These and other initiatives led to the GNGE project achieving an ‘Excellent’ score of 78% in Civil Engineering Environmental Quality Assurance (CEEQUAL). Huge effort was invested in engaging with schools to advise children of the even greater risks posed by trespass with the arrival of faster, quieter and more frequent trains. The Alliance’s Schools Liaison Officer made a total of 69 school visits and addressed over 15,000 children in all. These efforts were supported by a media campaign in newspapers, local radio and online. The successful outcome of all this work means that, in future, not only could journey times be cut but operating hours can be extended. This means it could be possible to introduce something local Council’s have wanted for some time – the introduction of a Sunday service. Previously these would have been too expensive to achieve due to the staff costs of keeping 13 signalboxes open on extra shifts. On the 9th September Transport Secretary baroness Kramer visited the line to see the work being done and officially open two important schemes. One was a new pedestrian subway, the other was the re-instatement of the Sleaford avoiding lines. 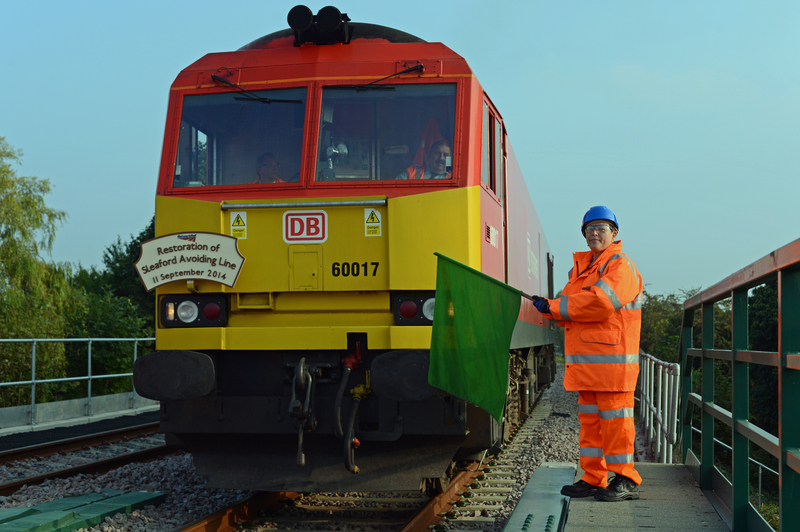 Here’s the Baroness flagging off a DB Schenker loco fitted with a commemorative headboad. On the 9th March Transport Secretary Claire Perry MP had a busy day visiting the GNGE to see the completed works & talk to local stakeholders & the project team. One of her tasks was to unveil this plaque on the new footbridge at Ruskington. This has replaced a barrow crossing, making the station both safer and accessible to all. 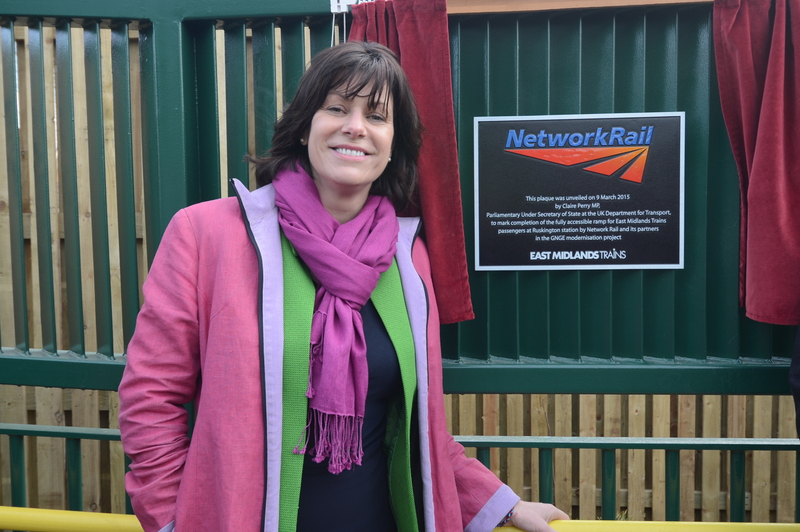 After unveiling the plaque at Ruskington, Claire Perry MP travelled the line back to Peterborough in an inspection saloon. She was accompanied by Network Rail’s LNE route director, Phil Verster & GNGE Alliance staff who pointed out the work that had been undertaken. 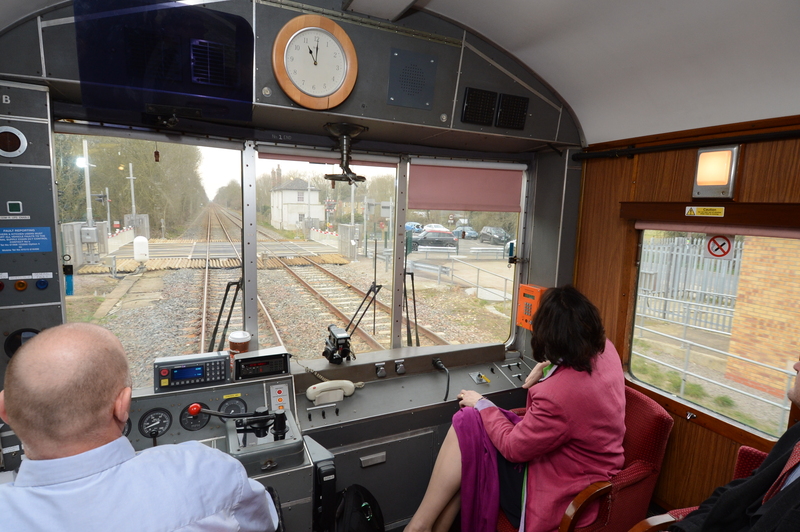 In this picture we’re passing Sleaford North Jn. The old signalbox still stands but it no longer controls the relaid junction & reconnected avoiding line. Over the weekend of the 2nd- 3rd February 2013 the junction at Sleaford North was renewed. 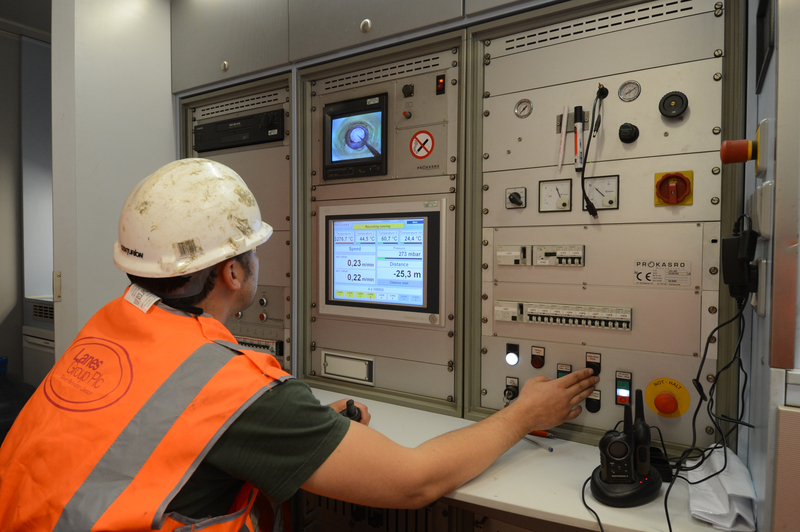 The new switches were brought to the site per-assembled using Network Rail’s new tilt wagons. Here, a pair of Kirow cranes maneuver one of the switches into place. In 2013 a series of culverts under the embankment near Stow Park were religned. These hadn’t been touched since the line was built in 1882. In some of them several courses of bricks has collapsed & needed to be replaced to prevent the danger of the embankment collapsing. In this health & safety conscious age there’s no question of sending men into such a confined space, so a more modern method was used to reline the culvert. Once debris had been removed a flexible liner was pulled through. Once in place, it was sealed at either end then inflated by compressed air in order that it pressed against the brickwork. Once this was done, a trolley equipped with UV lamps was run through the liner, baking it. The liner material then sets like concrete. It’s not a cheap fix. 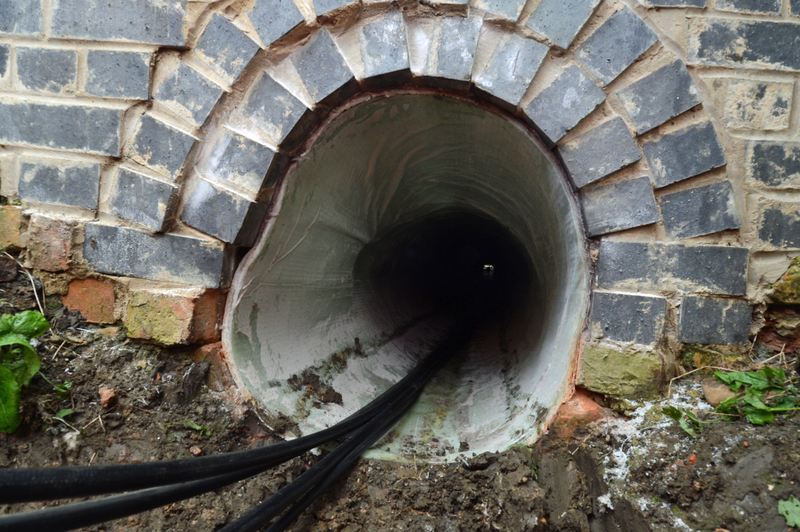 Depending on the size of the liner they can cost tens of thousands of pounds, but they’re guaranteed for over 60 years. Here’s one of the culverts after the work had been completed. The culvert lining process was controlled from this van. Here, the operator can control & monitor the whole process, ensuring that the liner is baked at the right level & that the UV trolley has passed all the way through the culvert. The system also provides a print-out of all the relevant data to show that the work has been done correctly. 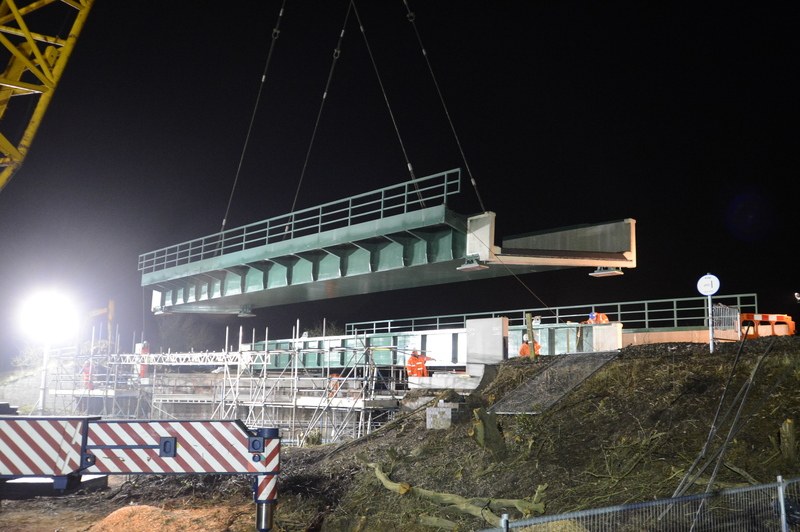 In March 2013 three different bridges on the Sleaford avoiding line were replaced during a 10 day blockade. 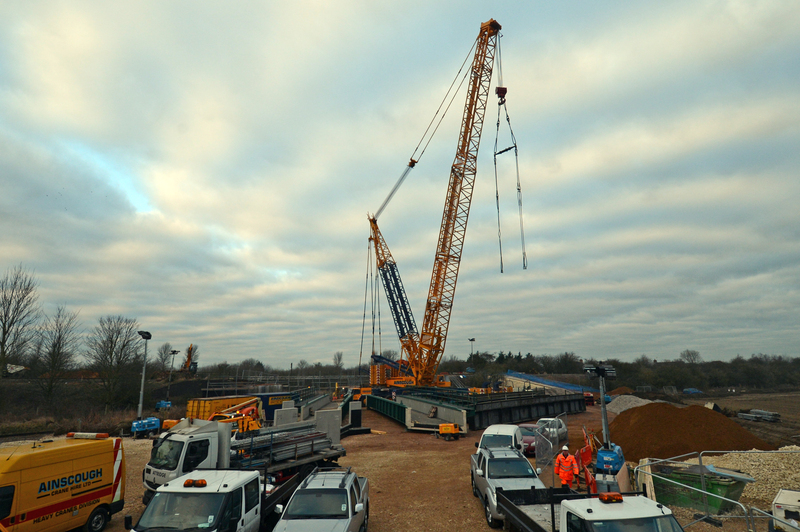 Here, a 1000 tonne crane rests after lifting out the old rail bridge over the railway line to Skegness. In the foreground to the left of the old bridge you can see the two sections of the new bridge ready to go in. 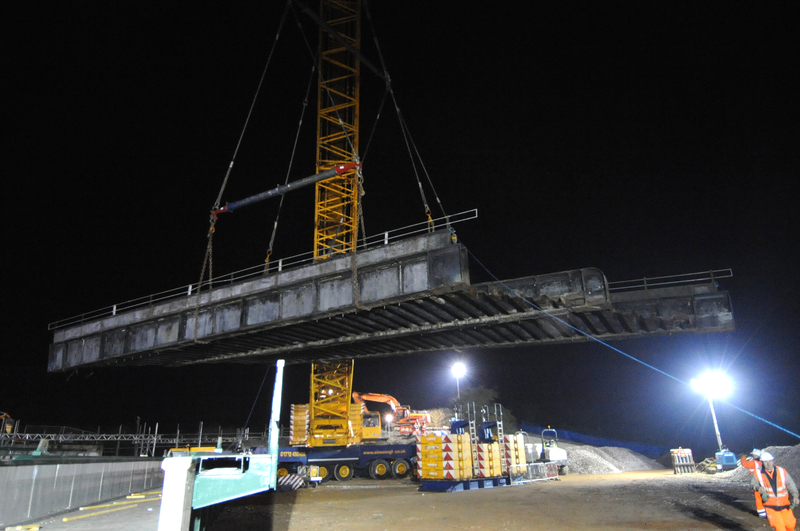 In the early hours of the 3rd March 2013, the old 90 tonne railway bridge that spanned the Skegness line is lifted out in one piece. 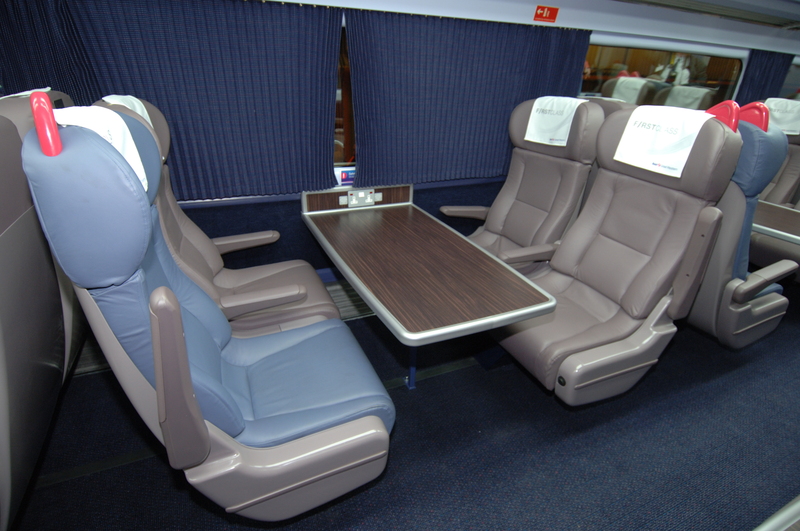 Today the Sunday times has featured ideas on what the interiors of the new Hs2 trains may look like. None of this is actually new, but the Times mentions that the trains will have a range of classes, some of which will be fitted with leather seats. This has caused absolute squeals of outrage from certain quarters, notably one Mop Denson, a Chilterns based anti campaigner. Mop is a regular, having frequently Tweeted that people should vote UKIP to ’save’ the Chilterns. The fact that UKIP don’t believe in man-made global warming & support fracking (so would do more damage to the Chilterns than good ) seems not to have occurred to her! I presume that Mop will now be starting a campaign to remove such extravagances from our existing fleet & have them replaced with less hard wearing & more difficult to clean cloth ones? It’s a month on from my blog exposing how little real support the anti Hs2 campaign has so I thought it was time for an update. After all, we’re in the run up to a general election & Hs2 has been in the news. The 3 major parties have all restated their support whilst UKIP & the Greens have restated their opposition. Has this galvanised the anti Hs2 campaign? The immortal words of the TV character Jim Royle spring to mind. Previously, I’d highlighted the fact that all their claims of ‘mass support’ & being a ‘growing campaign’ were nothing but hot air & I used their support on social media to illustrate this. Of course, since then the Jeremy Clarkson incident broke. That really went viral, both on social media & in the real world. Over 1 million folks signed a petition to get the presenter reinstated! 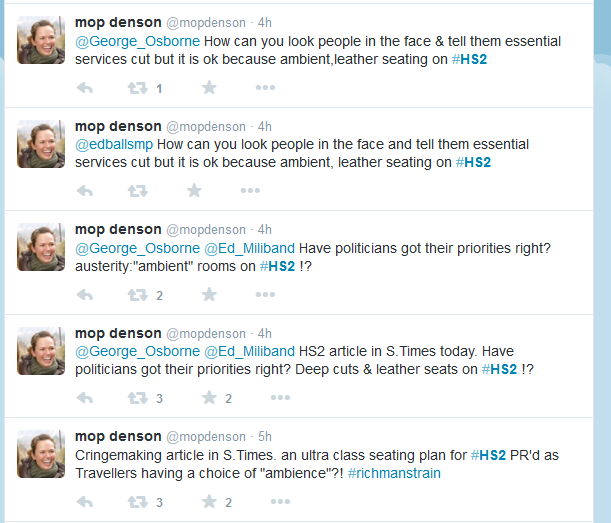 Let’s revisit the original 22nd February ‘scores on the doors’ for the Hs2 anti’s on social media. Today’s updated scores are in brackets along with percentage changes. I’ve also included both of StopHs2’s leaders. It’s worth noting that 51M’s FB account still hasn’t been updated since the 1st June 2011. Hmm, so much for that expanding campaign! Expanding? It’s actually shrinking on the media with the biggest penetration (Facebook) and hardly moving at all on Twitter (a medium widely regarded as stagnant). Not only are they failing to get their message across, they’re actually in retreat. Perhaps they should sack Joe Rukin & give his job to Jeremy Clarkson? So,next time you hear a few lazy journalists trot out the usual trite phrases about how there’s ‘strong’ opposition to Hs2, feel free to ask them, “where”? Thoughts on today’s ‘Northern Powerhouse’ announcements. It’s good to see that the report has added flesh to the bones of Hs3 by coming up with a variety of costed schemes. This shopping list of options should really help to move the debate forward. As for the total bill, it’s worth bearing in mind that all these schemes are loaded with a 60% ‘optimisation bias’ this should decrease once the schemes are worked out in detail. Of course, lots of questions remain. For example, what route would a new line through the Pennines take? 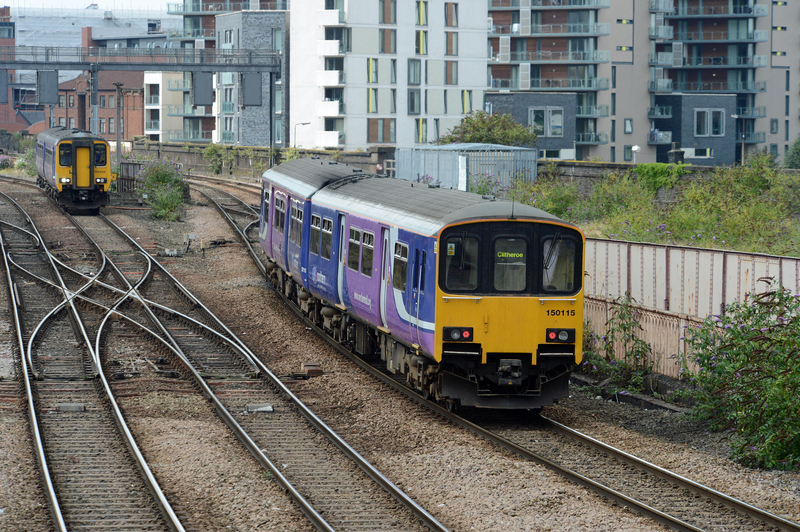 There are also implications for current plans to electrify the Leeds – Manchester Trans-Pennine route through the Colne valley via Huddersfield. Is the scheme likely to be delayed further by the announcement? Real positives are the way investment focus has shifted away from concentrating on London & the South East & the fact we (at last) seem to be looking at a strategy that involves looking beyond Parliamentary terms or even Network Rail control periods. No doubt the cynics will see these announcements as window dressing for the forthcoming election. I don’t subscribe to that view. There’s been too much work put in by too many folks on all sides of the political divide. Although I do have concerns about the way some Northern politicians all too easily lapse into parochialism – especially on the Eastern side of the Pennines! 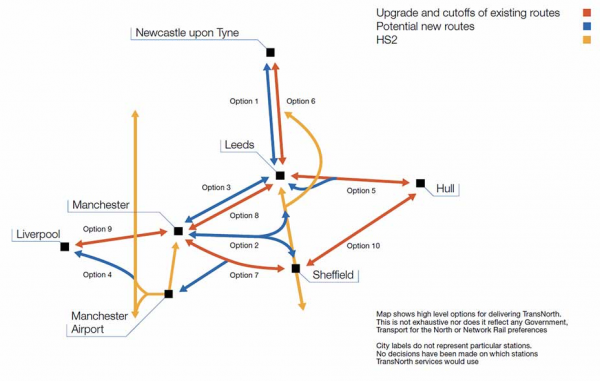 Other interesting parts of the announcement are the proposal to simply the fares structure & introduce what sounds like a Northern equivalent to London’s travel zones. Modernising ticketing with a contactless card system should also be welcomed. Freight often seems to be an afterthought in these grand plans so it’s a welcome change to see a freight strategy mentioned. Back on another favourite subject (Hs2) I believe this report & the people united behind it demonstrate just how irrelevant those campaigning against Hs2 are nowadays. Rather than it being stopped we’re seeing proposals to bring it to Crewe 6 years earlier than originally planned! 74. CHAIR: Are you a candidate on this occasion or not? 75. MR RUKIN: No. That was just a publicity stunt to get leaflets to everyone in the constituency for 800 quid. The ‘800 quid’ Rukin refers to is the deposit a candidate must pay to stand in an election (it’s actually £500 but then Rukin’s never been good with facts). Perhaps someone with either knowledge of the postal and/or electoral system might like to answer this unanswered question. Do Royal Mail get reimbursed to deliver election letters out of taxpayers money via the Electoral Commission or similar? If so. Rukin has surely fiddled the taxpayer? The Cabinet Office have confirmed that the Taxpayers DOES pay for the delivery of the minimum of one leaflet for each candidate in a General Election. This means there’s little doubt that Rukin’s cynical election tactic has duped taxpayers of thousands of pounds.